Microsoft Azure provides different technologies which enable you to build robust application, data and process integration solutions. 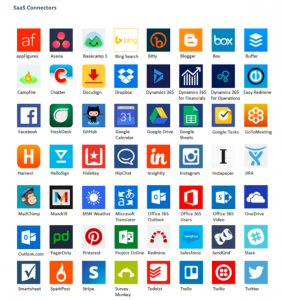 One of the core offerings for Azure integration is Logic Apps. These technologies together provide a very rich and fully-managed Integration Platform as a Service (iPaaS). It is a very robust and powerful platform to put together and automate integration workflows. Logic Apps also provides the concept of server-less computing, in which you just focus on what you want to achieve, without worrying at all about servers, patching and scaling. Logic Apps workflows, which can be easily arranged and executed graphically (via the Azure Portal or Visual Studio), are based on the Workflow Definition Language. These workflows provide abundent ways to process and manipulate data that can be obtained or pushed via different connectors. The breadth and capability of many different Azure technologies and how they complement each other is what differentiates Azure against other iPaaS vendors. Speak to out team about eStorm supporting your business with Microsoft Azure.